Musical Theatre of Los Angeles production of West Side Story at the Hudson Backstage Theatre. The show recently reopened due to acclaim - both critical and popular. It hasn't been an easy ride for this ensemble, but Krupin, along with the rest of the company, persevered to great success, making my Year End List of Bests. Q: Tell me briefly about your background and pursuit of a degree in the arts. JK: I was born and grew up in the Tri-Cities, Kennewick specifically, in the south east corner of Washington State. The unique history behind that area has given birth to a surprisingly large theater community, which I took blissful part in since age seven-- when my mother realized the reason I was sulking at the Seattle 5th Avenue'sproduction of R&H's Cinderella was because I was jealous of the performers. My father is from New York City and has had a fascinating life story of his own (I keep telling him to write a book) and after going to law school and working for the government, now runs his own company out of our basement. My mother is from all over (Jersey, Ohio, San Francisco) and works in health care as a nutritionist. Neither did theater growing up but dad actually had a gymnastics scholarship to college and mom was headed to be a ballerina. They met at aerobics class. I am of the completely non-biased, absolutely objective opinion that my parents and little sister are magnificent. After years of theater, dance and voice lessons and booking small but legit jobs in Seattle, I moved to Los Angeles at 18 to attend USC. I applied and was accepted to both the film and theater schools, and chose film after careful consideration of what degree might serve me best. I have a double minor in musical theater and philosophy. Musical theater is my drug of choice, but my university studies embody the myriad of interests I have. In the long run, I hope to wield all my studies in order to attain the highest possible level of storytelling in multiple mediums-- behind and on both camera and stage. Q: What are some of your favorite roles so far? JK: Well, Anita has recently attained her saucy self the top spot, but others on the list would have to include Diana in A Chorus Line. I played Diana back in Washington the summer following my freshman year of college. After the adventure of moving to LA and actually beginning the daunting task of making dreams come true, belting out "What I Did For Love" was epic. Like many musical lovers of my generation, I adore Sondheim. This affection has evolved into a deep respect after the university setting instilled in me a serious appreciation for the linguistics and language so carefully constructed in theater-- and in modern times, no one does alliteration, assonance and meaning in repetition like him. I would love to do Cinderella in Into the Woods again knowing what I know now. Also on my list would be Martha in The Secret Garden and performing Janis Ian's "Society's Child" in Beehive. Q: Do you long to play a certain role? JK: There are too many to count, and such a wide variety, but... Christine in Phantom, Anna in The King and I, Mimi or Maureen in Rent, Glinda in Wicked, Liza in My Fair Lady, Vanessa or Nina in In the Heights, Cathy in The Last 5 Years, anyone in Hair, Amneris in Aida, Elle Woods, the list continues... I would love to play Judas in JC Superstar. If anyone would like to make a daring casting choice, let me know. Q: Explain the challenges of playing Anita. JK: Anita is such a lush role, she offers the triple crown (awesome opportunity to sing, dance and act) for an actress-- but right off the bat, I knew that the most difficult part of her would be the fact that the role is SO well known. The choices made by Rita and Chita are carved into the very persona of the show. But the work in making the part my own is the work I love doing. Q: Explain some of the difficulties in mounting this West Side Story. JK: The difficulties were many, and if not for the love and fortitude within the people of the cast this show would not have happened. In early November, the love of our original director's life passed away. I remember being at rehearsal the night of the election and experiencing the dichotomy of elation at Obama's victory and yet feeling my heart ache for Ken. (Kenneth Gray-Scolari) The efforts of Arthur Ross (our choreographer) and Greg Haake (our music director) as well as the entire cast hoped to honor Ken and Rich by doing the absolute best show we could. Q: Who are your role models? Your favorite movie stars? JK: I am extremely lucky to have so many incomparable people in my life. One who has played my sister on stage more than once is Anne Spilman. She was my babysitter in the beginning and is my best friend now. She taught me how to French braid hair and how to find the best in people. I learned how to be funny from Anne. Her warmth is effortless and I aspire to her intelligence. She sent me a hallmark card that I still have that says, "You can tell we're friends because we're always having way more fun than it really makes sense to be having." Anne is flying down to see the show closing weekend and I cannot wait to see her. As for the famous folk, I admire JK Rowling. She gave the world a terrific example of a treasure of a story a woman can create and give to humanity. I admire Carol Burnett, she was funny in a way that we don't see enough of. I admire Kristen Chenoweth's and Eden Espinosa's vocal technique. I admire the humility of people like Johnny Depp and Julie Andrews. I admire Laura Linney's delicate but absolutely nuclear level of powerful acting. I admire writers-- Arthur Miller, Oscar Wilde, Tolkien...wow, this list could go on for a while. I can't leave out my fictional hero. My little sister turned me on to a series of medieval fantasy books by Tamora Pierce called "The Lioness Quartet". The protagonist's name is Alanna and I think of her whenever I want to do something that scares me. Q: What do you feel is your goal as an actress? JK: When Hugh Laurie accepted his Emmy, I believe he said something like, "Many can do good work, but few get the opportunity to do it." It’s my job to keep working to get the work, and then work more in order to do it well. That's my goal, work well. It makes me happy. Q: How would you sum up the importance of theatre in our lives? JK: I believe theater is a shrine to the human experience. Human societies and cultures are cultivated on the stories they tell over and over again. The tragedies and triumphs that endure do so because people love and identify with the complicated truths about living that only storytelling, only theater, can articulate. My mythology professor said one of my favorite things about stories and why we keep telling them. "As idealists, we have much more important things to contemplate than facts." 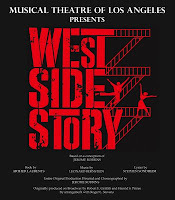 West Side Story is extended at the Hudson Backstage until February 22. Visit Plays411 for reservations. It's selling out fast! !